Sumthing Else Music Works release the original soundtrack from Season 2 of METAL HURLANT CHRONICLES, the live-action sci-fi television series based on the popular comics anthology 'Métal Hurlant,' also known internationally as 'Heavy Metal' magazine. 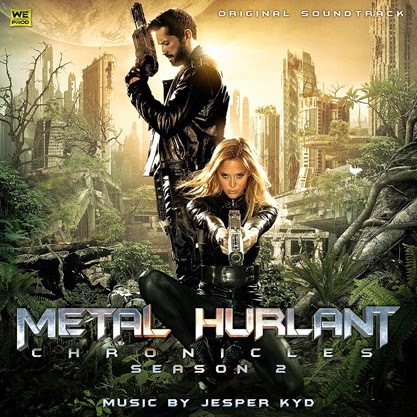 Available for digital download worldwide, including iTunes, Amazon and Sumthing.com, the METAL HURLANT CHRONICLES Season 2 soundtrack features 40 tracks composed by BAFTA award-winning and Billboard/MTV VMA nominated composer Jesper Kyd (Assassin's Creed, Borderlands, Hitman). Preview samples are available on Soundcloud. In the lineage of cult series such as The Twillight Zone, The Outer Limits, and Tales From The Crypt, METAL HURLANT CHRONICLES is the science fiction live-action adaptation of stories from the eponymous world-renowned magazine that gave birth in the United States to Heavy Metal. From 1960s cold war drama to distant future, fantasy to medieval, METAL HURLANT CHRONICLES spans a wide range of self-contained stories linked together by an asteroid, called the 'Métal Hurlant', which passes close to the planet where each episode's story is taking place, thereby changing the outcome. METAL HURLANT CHRONICLES stars Michael Biehn (Aliens, The Terminator), John Rhys-Davies (The Lord of the Rings, The Raiders of the Lost Ark), Rutger Hauer (Blade Runner), James Marsters (Buffy The Vampire Slayer), Joe Flanigan (Stargate Atlantis), Michael Jai White (Spawn), Darren Shahlavi (Arrow), Scott Adkins (The Bourne Ultimatum), and Kelly Brook (Smallville). Season 2 recently debuted in the US on Syfy and is currently showing across 80 countries worldwide.